Bodybuilders — and metamorphoses — are at the center of the fascinating new doc Man Made. “I was taken with the whole metaphoric theme of making your body and creating your image to be how you see yourself,” Téa Leoni, star of Madam Secretary, recently told Entertainment Weekly. “I met T years ago [but] had not heard him lit up like this about something, maybe ever. I knew the film had to be made and I knew he had to make it.” Leoni signed on as an executive producer. The film also garnered support from Sundance. Focused on TransFitCon, the world’s only transgender bodybuilding competition, Man Made is Cooper’s first film. The trans author of the nonfiction book Real Man Adventures is best known for his eight novels (including best sellers The Beaufort Diaries and Lipshitz 6 or Two Angry Blondes). Cooper is also a screenwriter (The Get Down, Copper) and a just-announced addition to Emory University’s Creative Writing Program. His ninth book, the fourth in the young adult Changers series (which he wrote with his wife, Allison Glock-Cooper), comes out this fall. Cooper now lives in Atlanta, where TransFitCon takes place, and filmed some of Man Made in the South, including in Conway, Ark., a small town where one of the men, Kennie, lives and starts his physical transition while preparing for the bodybuilding competition. Before coming out as trans, Kennie had identified as a lesbian and had been the target of harassment and violence. Kennie’s story is a reminder that there are trans (and queer) people living in small towns and rural communities all across America — in what we might call Trump country — including alongside the kind of white men who use violence to police and control behavior of minorities, be they black, queer, trans, or female (the women being “looked at” aren’t the subjects of their own narratives, but possessions, the ownership of whom “rightfully” falls to those in power). Yet even as he slept in public parks, Rese continued to train for the bodybuilding competition. There was another goal that Rese had: getting back custody of his son, De’montae. The boy lived with relatives while Rese was homeless, but he remained in frequent contact, and Rese says working out brought them closer. 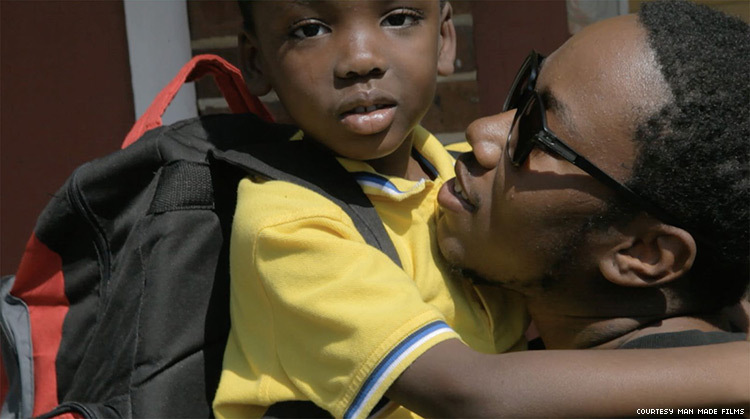 By the end of the film, Rese’s living situation has improved, and his son is living with him again. The now-7-year-old calls Rese “Mommy,” but Rese dismisses any suggestion of discomfort. 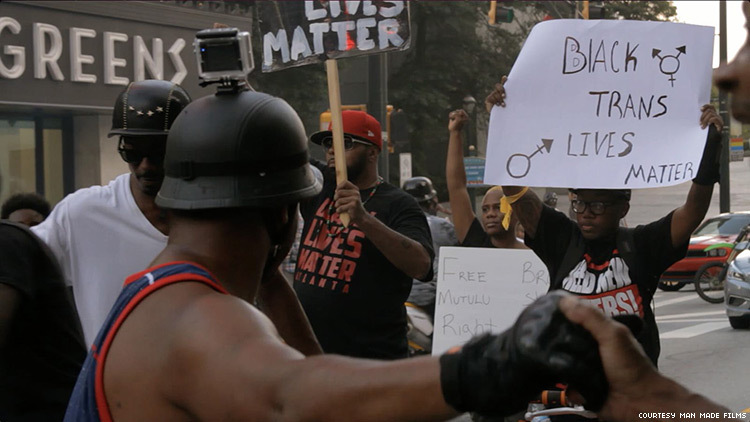 Rese, who became a Black Lives Matter activist during the filming of Man Made, says for him, the ignition point for his outrage was the murder of a transgender friend, Crystal Edmonds, who became the 21st trans person killed in 2016. Bodybuilding takes a lot of work — regardless of whether someone is cisgender or trans. Mason, another bodybuilder in Man Made, is one of the few transgender men who is participating in cisgender competitions. Cooper filmed at one such event and includes footage in the doc. But this kind of heady analysis isn’t explicit in Man Made, nor even essential to the film. Cooper says for guys like Mason and Rese, this is simply a sport that makes them feel good — mentally and physically — and therefore is helping them stay alive and be the amazing, multifaceted men they are. Man Made premiered earlier this year at the Atlanta Film Festival, where it took home the 2018 Best Documentary Feature Jury Award. The film continues to wow audiences at other film fests and will soon get two screenings at Frameline (June 16 and 21), the San Francisco International LGBTQ Film Festival, the world’s oldest and largest queer film fest. In addition, Outfest just announced that Man Made has been chosen to screen (July 21) at the Los Angeles festival, which has been promoting LGBT stories on film since 1982.